It had been a while since my first brewing adventure (a huge IPA) and I was keen to have a go at a different style. The first brew was reasonably successful to the point I was brave enough to hand some bottles out to fellow home brewers, with positive and encouraging feedback being received along with some great advice on how to overcome some of the problems I'd encountered while brewing it (with special thanks to David Bishop @broadfordbrewer). I also seized the opportunity more recently to get some under the nose of Evin at Kernel, who provided some stellar advice on yeast pitch volumes and first wort hopping when tackling the double IPA style. Armed with the experience of my first all-grain brew and a bag full of New Zealand hops from our recent trip, I fired up BeerTools Pro and set about piecing together a recipe, having researched some previous home brew recipes for inspiration. This was to be my contribution to the Saisonathon Phil Hardy (@filrd) over at the excellent Beersay blog had been scheming. 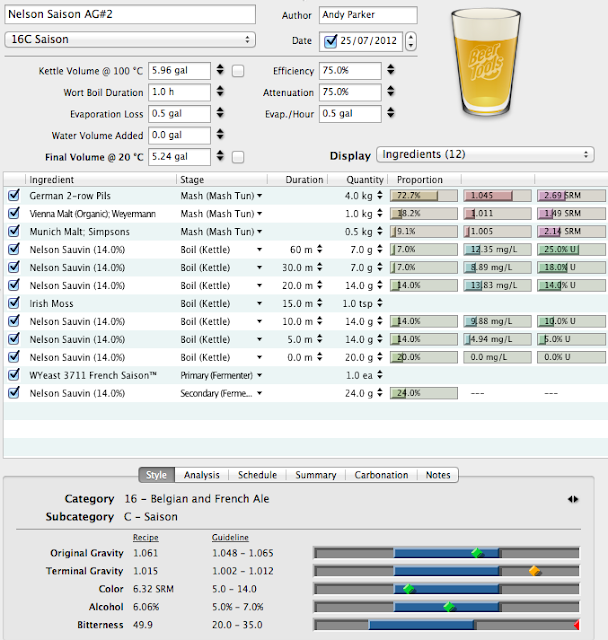 The malt bill is, I think, fairly typical of a Saison with the bulk coming from Pilsner malt. The hop schedule saw only half an ounce hit the kettle within the first 40 minutes, with a further ounce and a half being added before the final dump of three quarters of an ounce at flame out. I let this last addition sit for a while (having stirred up a whirlpool) to give it plenty of exposure to the wort before cooling it down to pitching temperature and transferring to the FV. The recipe calculator suggests it'll be 50 IBUs, which is outside the style guidelines but not insanely bitter. The choice of French Saison yeast over the Belgian Dupont strain was driven purely by the temperatures at which it does its work, which perfectly matches that of my fermentation (ahem, dining) room. Brew day went fairly smoothly. The OG was slightly lower than the target at 1.058. The yeast got to work quickly but after a week it was sat at 1.020, without much airlock action going on, so I transferred it to a glass carboy to give it a bit more head space and wrapped it in a blanket to encourage it along. This seemed to do the trick and I'm now patiently waiting for this slow-burning yeast to finish off and hopefully take it down to 1.006 or so, which'll put it in the 6% ABV ball park. I was really pleased with the most recent sample I took. The aroma and taste was encouraging and I'm hopeful this'll be ready and tasting good by the time Saisonathon rolls around on Saturday 15th September. Looks great Andy! I hope we get to swap at IndyManBeerCon!